In an effort to offer improved service and clear guidelines for all University-funded, sponsored research or grant-funded travel, Syracuse University is implementing a revised travel and entertainment policy effective Sept. 1. The new policy names BTI The Travel Consultants, a Syracuse-based independent travel management company, as the University travel management partner for airline tickets, hotels and car rentals. In addition, the University will adopt Concur, an online travel portal that’s available 24 hours a day, seven days a week, for domestic and international travel. The new policy applies to faculty, staff and students who travel in official University capacities, both domestic and international, and need to be reimbursed for their expenses. Based on historical travel expenses of the University, it is expected this new policy will realize savings of $2 million annually. Once the policy is in effect, measurements will be incorporated into the initiative to ensure the University is achieving the most competitive rates for its travelers. According to several benchmarking efforts led by the Fast Forward Syracuse travel and entertainment initiative team, a number of large, private, research institutions have instituted a mandated travel policy to improve efficiencies and are utilizing Concur as their software tool for online travel booking. By partnering with BTI and implementing Concur to facilitate flexible online booking, University travelers will have access to a 24-hour-a-day travel assistance, achieve immediate cost savings and reduce administrative burden. In addition, the policy allows for accurate volume data collection for the University to obtain further discounted airline rates for the future. Previously, there was no formal, standardized location to offer assistance to University departments and travelers. Attendance at all of the sessions is not required. 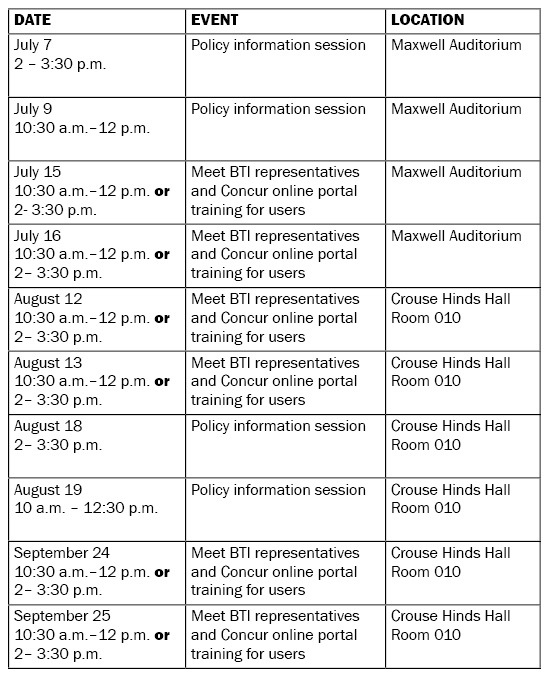 The same information will be provided in each BTI/Concur session. Pre-registration to attend an information or training session is recommended. To register for an information or training session, please complete the form. To request accommodations/ASL/CART, at least 72 hours in advance of information or training sessions, call 315-443-2281 or email at purchase@syr.edu. Questions about this specific policy can be directed to Douglas Freeman at 315-443-2038 or dhfreema@syr.edu. For more information, the travel policy can be read online and includes frequently asked questions, resources for individuals to learn more, and a list of non-reimbursable expenses.